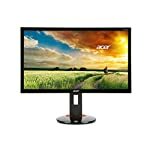 The Acer Predator Z35 is a 35″ ultra wide screen that aims to give you total immersion in gaming. Not only will this fill your field of view, it will also fill your desk – this is a big monitor! If you like the height of a 27″ monitor but are after an ultra wide format then 35″ is the size to go for. As you can seethe Acer will be a little taller than a 16:9 standard wide screen 27″ monitor and obviously a lot wider. Note that his is still essentially a wide-screen monitor, it has 1080 horizontal lines. The Predator forms part of Acer’s gaming range, as such it comes with the features you’d hope to find. You’ve got a blazing fast 200hz refresh rate, a VA panel with a 4ms response time and also Nvidia’s G-Sync technology all set and ready to go. If the Z35 isn’t quite what you are after, it’s little brother gives stiff competition. 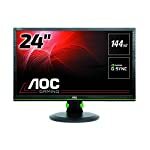 The Z35 is a big monitor, at 26.9 by 33.2 by 11.8 inches (hwd) it’s going to take up a lot of space on your desk! The overall styling fits in with the Acer Predator brand, you’ll find the same black and red colour scheme found on the other models in this range. Whilst it does make the monitor look somewhat meaner I’m not sure it’s going to really fit in with my otherwise professional looking home office. But each to their own, this will certainly look the part in a game orientated set up or teenage bedroom. The screen is curved which in theory helps to immerse you in the game by wrapping around your field of vision. With a 2,000R curvature (this means that if you were to make a circle out of these monitors it would have a 2000mm radius) it has a bigger curve than some of its rivals. There is some limited movement in the stand, you get 5 inches of height and 30 degrees of tilt adjustment, but no side to side pivot and clearly you won’t be positioning this in a portrait configuration! The built in speakers deliver better than average base which makes a change from the typical poor speakers we find on PC monitors. Inputs are limited to a full-size DisplayPort and an HDMI socket. You also get a USB 3.0 hub. The Acer Predator Z35 has a VA (Vertical Alignment) panel that is built to provide improved colour accuracy and deep blacks. Professional reviewers have found that some calibration is required to get the best colour setup, the out of the box experience is a little hit and miss. Viewing angles are better than TN based screens but still not as good as you can get with IPS. Still, it doesn’t do badly. Gaming performance is where this screen really excels. You should notice no motion blur or ghosting in fast action games. The Z35 has built in overclock functionality, allowing you to select from 160Hz, 180Hz, and 200Hz refresh rates. Switching on G-Sync will give you a noticeably smoother image but the Predator performs well without it too. We give the Acer Predator Z35 a 4 out of 5 rating. Want to know what existing owners of the monitor think? You can read real user reviews here. 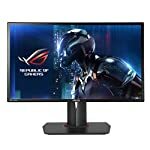 Should I buy the Acer Predator Z35? 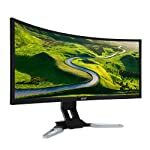 The Z35 is a 20:9 ultra wide monitor that can run at 200hz. 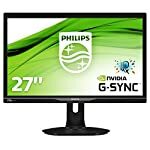 With built in G-Sync this 1080p screen will give a great gaming experience. If you are having some doubts about this purchase then why not read some real owner reviews and see what other buyers think.